Photomica is a online photo editing website which can fill all your fun needs to edit the photos. You can always get the desired effects and changes in your photos and have fun with your friends. 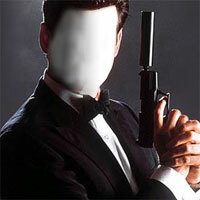 You can see the James Bond without his face in the above effect. One can upload his images and adjust the face to fit into this effect. After you set your face into the James Bond's effect you can save the photo to your desktop or laptop and share it online with your friends. So, the face in hole effect online - photomica works great to have fun.